The left does not care about gay marriage. In most left-wing regimes, homosexuality was persecuted. It was illegal in the USSR. Gay men were locked up in Cuba and are still targeted in China. Nicolas Maduro, the current hero of the left, openly uses homophobic language without any criticism from his Western admirers. It goes without saying that homosexuality is criminalized throughout the Muslim world. The left’s shift on this issue, as on many issues, was purely tactical. The left’s leading lights were racists who jumped into civil rights. They were sexists who became feminists. They were advocates for the working class who despised the idea of working for a living. Terrorists and states negotiate differently. Terrorists escalate a conflict to achieve leverage for their latest demand. They don’t seek a final settlement. There can be no final settlement because that would mean the end of terror. Arafat and Abbas always negotiated the same way. They arrived prepared to disrupt the negotiating session at a crucial moment. The “peace process” was their hostage and they always hijacked it and began issuing demands. It’s no surprise that the same thing happened yet again. How did that dialogue go? LG: Give back our TV’s. DNC: Why are you people so racist? LG: What? Who said anything about race? DNC: Homophobes! We are the 99 percent. Your televisions have been occupied by the poor. They were unsustainable. Hope and change. Mulayam Singh Yadav defended rapists saying sometimes boys make mistakes. A woman was taken into custody after throwing what she described as a shoe at Hillary Clinton during a Las Vegas speech. While Google Chrome has been struggling with market share, Firefox has been in a steady decline down to 17% market share in March from 20% in May of last year. Firefox fell below 18% this year so that it no longer even claimed a fifth of internet users. The Noah drop is worse than Russell Crowe’s previously unpopular Robin Hood which only fell 48% on its second weekend. At the rate that Noah is falling, it will likely not make back its production budget domestically, let alone its promotional budget. Cinemascore still rates Noah at C indicating that audiences hate it more than any other movie in current release. With all the publicity that Letterman’s retirement is getting, you would think that anyone was still watching the Late Show with David Letterman. By 2011, Nightline was beating both Letterman and Leno among young viewers. Elect a madman, get insanity. Forget the economy and Ukraine. Let’s pivot to cow burp prevention while raising meat prices. Last year, Bin Shakaran announced that he had a big new Jihad going down. Ibrahim Bin Shakaran aka Brahim Benchekroune went on a social media Jihad. Brahim Benchekroune created accounts on Facebook, Twitter and YouTube to attract Moroccans to his new jihadist movement, Sham al-Islam. The group also announced a media arm, “the Mashers” Foundation, to oversee its public outreach. On August 31st, the group outlined its principles, based on al-Qaeda’s takfirist ideology. “We consider democracy to be kufr against God Almighty and a doctrine that is in contradiction to Allah’s sharia,” Sham al-Islam said. The movement calls for engaging in jihad against apostates from Islam. Krone came by his hard edge honestly. He spent more than 15 years in the private sector, where he once lobbied for the National Cable & Telecommunications Association, and more recently was a top Comcast executive. Krone also became one of the senator’s biggest donors, giving about $35,000 to Reid’s campaigns and leadership political action committees, according to the Center for Public Integrity. The only reason that Pollard even came up is because Netanyahu tried to stall the endless demands by claiming that he couldn’t keep making concessions without bringing down his government. But that assumes that Obama doesn’t want to bring down Netanyahu. Instead there’s every reason to believe that he does. So why would Obama give Netanyahu anything? Neoconservative positions on foreign policy have shifted over the years. Their broad center, a strong military, peace through strength, values export and international alliances against geopolitical enemies don’t have much opposition from either side which is why most of Washington is neo-conservative; whether or not it uses that term. Gore has been churning out new environmental screeds (or his ghostwriters have) every few years. Even devoted Warmists would have trouble naming a single one. Our Choice was Gore’s literary sequel to An Inconvenient Truth. Then came The Assault on Reason. Followed by The Future. Then Earth in the Balance. Every few years reviewers dutifully comment that Al Gore (or his ghostwriter) has written another “passionate”, “informed” plea for everyone to go back to the caves and pay him lots of money for fire carbon credits. Successful foreign criminals wear the best brands, Nike or Adidas, wearing gold watches, necklaces and bracelets, and sunglasses luxury. Many of them resemble the look nicer part of American rappers. While the soldiers are living in apartments and moldy old room south of the city, senior bosses can afford to rent apartments of three and four rooms and frequently travel in taxis. Chief Illiniwek was already eliminated by the University of Illinois at Urbana-Champaign, but the Chief has stuck around despite attempts to ban him. Islam is a totalitarian ideology. They suffered under it. Yet they do not condemn it. They talk as though Islam can be "reformed" or recast as a tolerant, humane creed. It can't. It is, root, trunk, and branch as evil an ideology as Nazism and Communism. I don’t think they were afraid to condemn Islam. I think their statements about it reflect a profound ignorance of its ends, or a collective delusion. To a woman, they stress that Islam's depredations against women are "cultural," not "political." They do not see that those crimes – forced marriages of children and adult women, female genital mutilation (FGM, or, what a friend prefers to call it, "female castration"), the role of "honor," and the ubiquity of "honor killings" in Muslim and Western countries – are intrinsic to the ideology, not aberrations or anomalies. Two segments of Honor Diaries impressed me, and not positively. One indicated just how accommodating the film is to Islam. This segment featured one of the participants, an American, Raquel Saraswati. She had a pierced nose and a pierced lower lip. Her eyebrows looked painted on. She wore the whole "approved" Muslim garb for women, including an unflattering hijab, most of it outlandishly decorated. The overall impression was that she could've been a dancer for the Star Wars villain, Jabba the Hut. At one point, the film showed her preparing to pray and praying. That segment underscored the film's, and the participants', acceptance of Islam as a legitimate creed. The bottom line is, you don’t beat an idea by beating a person. You beat an idea by beating an idea. Not only is it counter-productive—nobody likes the kid who complains to the teacher even when the kid is right—it replaces a competition of arguments with a competition to delegitimize arguments. And what’s left is the pressure to sand down the corners of your speech while looking for the rough edges in the speech of your adversaries. Everyone is offended. Everyone is offensive. Nothing is close to the line because close to the line is over the line because over the line is better for clicks and retweets and fundraising and ad revenue. ... if this view reflected liberals in general, it might be possible to have a conversation, but it doesn't. And there's no reason why it would. The debate has long since become internal rather than external, an assertion of anger and contempt. The left's views have become fixed in amber even as they keep "evolving". Functioning within a bubble, they have become unused to dissent and convinced that since they are on the right side of history, it is their sacred mission to stamp out reactionary views. Jonathan Chait's anticipated New Yorker piece on Obama and race has finally come out, to boos from the left, and it's mostly predictable, depicting conservatives as out of touch racists in denial. It’s unlikely that Obama is deliberately plotting to associate his opponents with white supremacy in a kind of reverse-Atwater maneuver. And yet that's what liberals have been doing for a long time now to the extent of labeling any conservative views as covert racism. That indeed is the purpose of invoking Atwater, to prove that even innocuous views are coded racism. It's not really a reverse-Atwater, it is Atwater, instead of shouting a racial slur, they're shouting racist. Liberals experience the limits of historically determined analysis in other realms, like when the conversation changes to anti-Semitism. Here is an equally charged argument in which conservatives dwell on the deep, pernicious power of anti-Semitism hiding its ugly face beneath the veneer of legitimate criticism of Israel. When, during his confirmation hearings last year for Defense secretary, Chuck Hagel came under attack for having once said “the Jewish lobby intimidates a lot of people up here,” conservatives were outraged. (The Wall Street Journal columnist Bret Stephens: “The word ‘intimidates’ ascribes to the so-called Jewish lobby powers that are at once vast, invisible and malevolent.”) Liberals were outraged by the outrage: The blog Think Progress assembled a list of writers denouncing the accusations as a “neocon smear.” The liberal understanding of anti-­Semitism is an inversion of conservative thinking about race. Liberals recognize the existence of the malady and genuinely abhor it; they also understand it as mostly a distant, theoretical problem, and one defined primarily as a personal animosity rather than something that bleeds into politics. Their interest in the topic consists almost entirely of indignation against its use as slander to circumscribe the policy debate. And that is an interesting point, since indeed the left considers anti-semitism complaints to be a pretext for a smear. Of course, the real cause of the declining coffee production is fungus- and insect-derived problems befalling these large mono-cultures. These problems would be easy to overcome with genetic improvements of the coffee plants as has been done for grains and other fruits. However, some coffee aficionados vehemently resist such intentions. They want their morning double-double beanies grown without the use of any “-icides” or genetically enhanced beans. I think here is your chance to invest in my up-and-coming enterprise of the Greenland Mountain Coffee Cooperative (GMCC). With the claimed rapid melting of the ice sheet on Greenland it ought to be just a matter of time when your investment in coffee trees on Greenland’s slopes (yet to be planted) will bear a rich harvest. The GMCC is currently taking on new (only well-heeled) members; serious inquiries welcome. We’ll even invite you to a free double-double. 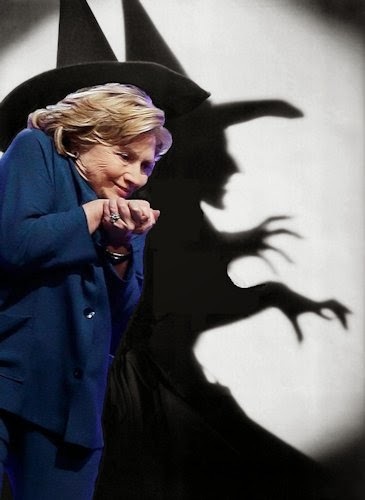 Love the Hillary "Wicked Witch Trying to Scare You" photo shop. Catches her character to a T. Broomstick optional and irrelevant. 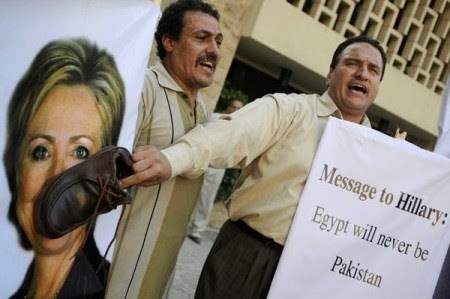 Maybe if enough people throw shoes Hills will have to cancel all her appearances. Karma may get her yet..